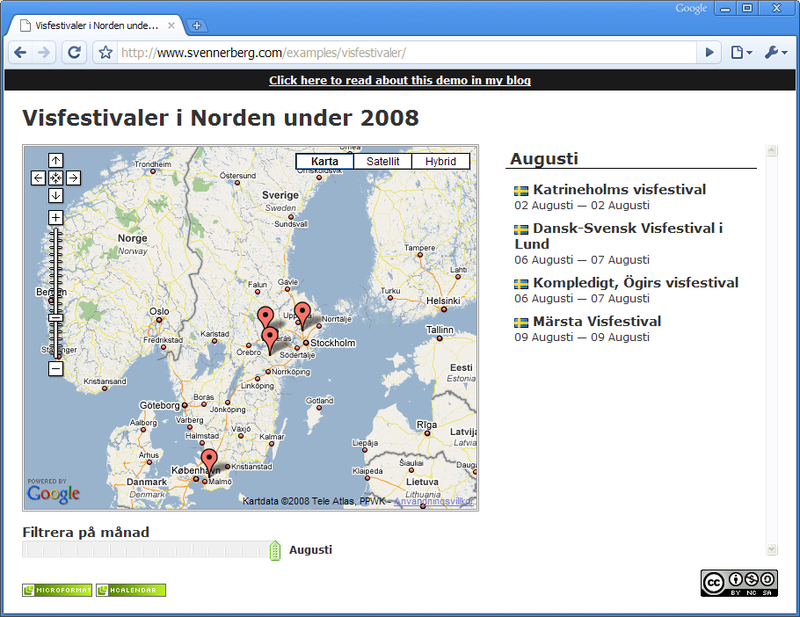 Please read about my first take in Using microformats to populate Google Map. The demo is still in Swedish since I originally made it for a lecture here in Sweden about using Microformats. But despite that I think it’s fairly easy for all you non-swedes to follow the code. So what have I done in this new version? In the old demo I used some deprecated Google Maps 1.0 methods. In the new demo these are replaced with Google Maps 2 methods. I wanted to be able to easily filter the result by month using a slider. Since jQuery UI features a nice Slider I went with that. Adding the slider was fairly easy. I used the default graphics and just tweaked the slider-background a little bit in Photoshop. When you click on a marker in the map the appropriate element in the sidebar list is highlighted. When the list is long enough to be scrollable it sometimes means that the highlighted item isn’t visible. I wanted a way to make the list scroll so the item came into view. Where element is the list and obj is the selected item. If you want to try the demo and check out the files, please use the links below. Despite being new to web programming I got this example to work with my own data. Finally completed it with modifications to suite my site and published it. John C: That’s good to hear! Do you have a link to it? It would be fun to see it!